The digital edition of our print magazine is created with “flipbook technology,” which allows you to turn pages as naturally as a print magazine. The colors are bright, the contrast is excellent, and the feedback on your advertising can be instantaneous. The digital edition drives traffic to your site, fosters interactivity with readers, can help you gather e-mail addresses, do a survey, or conduct a contest. All ads and editorial mentions have hyperlinked URLs to your website. Our editions and accessible from our magazine’s homepage. We provide all the search engine optimization to ensure good search results for your ad. We offer some powerful programs that create impact within the digital edition, including interactive inserts, motion graphics in your ads, video links to your ad, animated belly bands (see sample, bottom right), or gather sales leads with a pop-up landing page . We can create custom editions an exclusive web-only editions. 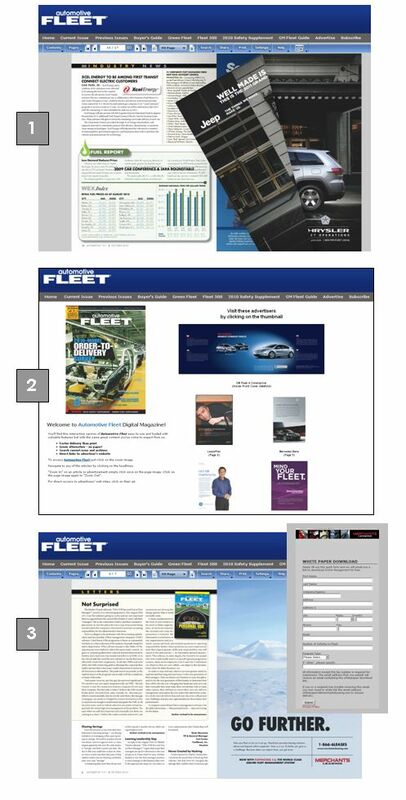 See our GM Fleet Guide sample here. Advertising on the digital edition "portal page"  is available in several positions: top leaderboard (which runs throughout the entire edition), as well as six thumbnail ads, which go directly to your ad when clicked. Rates depend on the features. Please give us a call to talk about digital edition options. BROWSE our latest digital edition here.